In this picture: President Hamid Karzai of Afghanistan, center, speaking with his chief of staff, Umar Daudzai. Officials say Mr. Daudzai serves as a conduit for Iranian cash into the Karzai government and may be trying to poison Afghan relations with the United States. KABUL, Afghanistan — One evening last August, as President Hamid Karzai wrapped up an official visit to Iran, his personal plane sat on the airport tarmac, waiting for a late-running passenger: Iran’s ambassador to Afghanistan. The ambassador, Feda Hussein Maliki, finally appeared, taking a seat next to Umar Daudzai, Mr. Karzai’s chief of staff and his most trusted confidant. According to an Afghan official on the plane, Mr. Maliki handed Mr. Daudzai a large plastic bag bulging with packets of euro bills. 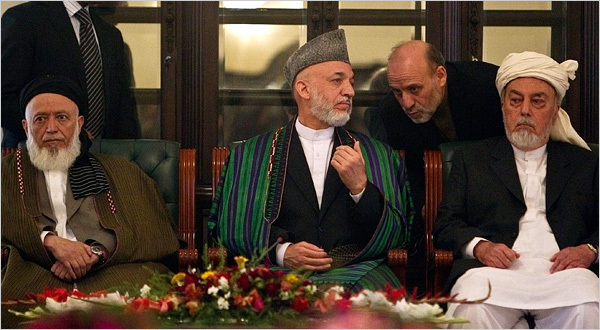 A second Afghan official confirmed that Mr. Daudzai carried home a large bag of cash. The bag of money is part of a secret, steady stream of Iranian cash intended to buy the loyalty of Mr. Daudzai and promote Iran’s interests in the presidential palace, according to Afghan and Western officials here. Iran uses its influence to help drive a wedge between the Afghans and their American and NATO benefactors, they say.